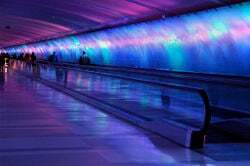 A tunnel is an underground passage. In general, tunnels are at least twice as long as they are wide and are completely enclosed on all sides, save for the openings at each end. 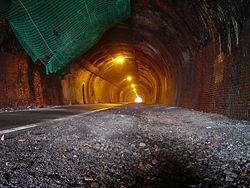 A tunnel may be used by pedestrians, cyclists, motor vehicles, or rail traffic. A tunnel may also be used for a canal or a flow of water—for consumption, for hydroelectric purposes, or for sewers— or it may carry other utility services such as telecommunication cables or steam pipes. Some tunnels are designed as wildlife crossings. The Cu Chi Tunnels of Vietnam are a vast underground network once used by Vietnamese fighters as secret residences and means of escape. Historically, tunnels have played an important role in facilitating commerce and travel between points separated by mountains, rivers, bays, and even straits. Improvements in tunnel boring machines permitted the construction in the twentieth century of such undersea tunnels as the Channel Tunnel connecting England and France and the Seikan Tunnel, the longest undersea railroad tunnel in the world at 53 kilometers (33 miles), connecting the Japanese islands of Hokkaido and Honshu. Above ground, similar technology has been used, for example, in boring the pair of 28.4 kilometers (17 miles) Guadarrama tunnels completed in 2007 for carrying high-speed rail traffic between the Spanish cities of Madrid and Valladolid. An increasingly necessary interdependence compels human beings toward the construction of more long tunnels both above ground and below the sea to advance human unity as one global family exchanging and sharing agricultural and manufactured products, resources, energy, services, and knowledge. In coming decades the tunnel may see its penultimate fulfillment in connecting the continent of Eurasia with both Africa and North America as there are major initiatives underway toward constructing tunnels under both the Strait of Gibraltar and the Bering Strait. Such efforts can be invaluable for bringing the ideals and challenges of global peacemaking into sharper focus and real juxtaposition. 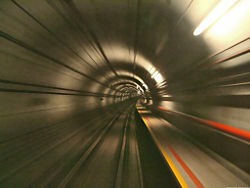 Rapid transit networks: The central part of a rapid transit network is usually built in tunnels. To allow non-level crossings, some lines run in deeper tunnels than others. At metro stations there are usually pedestrian tunnels from one platform to another. Often, ground-level railway stations also have one or more pedestrian tunnels under the railway to enable passengers to reach the platforms without having to walk across the tracks. However, in the United Kingdom, bridges are an equally popular method of pedestrian access between two or more different station platforms. Overbridges: An overbridge can sometimes be built by covering a road, river, or railway with brick or still arches, then leveling the surface with earth. In railway parlance, a surface-level track that has been built or covered over is called a covered way. Protection for railways: A snow shed is a kind of tunnel built to protect a railway from avalanches of snow or falling rock. Utility ducts: Utility ducts are man-made tunnels created to carry two or more utility lines underground. Through co-location of different utilities in one tunnel, governments and companies are able to reduce the costs of building and maintaining utilities. Underground bunkers: The construction of underground bunkers and other habitable areas are often associated with military use during armed conflict, or civilian responses to the threat of attack. For water crossings, a tunnel is generally more costly to construct than a bridge. However, navigational considerations may limit the use of high bridges or drawbridge spans when intersecting with shipping channels at some locations, necessitating use of a tunnel. Additionally, bridges usually require a larger footprint on each shore than tunnels; in areas with particularly expensive real estate, such as Manhattan and urban Hong Kong, this is a strong factor in favor of tunnels. Boston's Big Dig project replaced elevated roadways with a tunnel system in order to increase traffic capacity, hide traffic, reclaim land, redecoration, and reunite the city with the waterfront. Examples of water-crossing tunnels built instead of bridges include the Holland Tunnel and Lincoln Tunnel between New Jersey and Manhattan in New York City, and the Elizabeth River tunnels between Norfolk and Portsmouth, Virginia and the Westerscheldetunnel, Zeeland, Netherlands. Other reasons for choosing a tunnel instead of a bridge are aesthetic reasons (i.e. preserve the above-ground view, landscape, and scenery) and also for weight capacity reasons (it may be more feasible to build a tunnel than a sufficiently strong bridge). Some water crossings are a mixture of bridges and tunnels, such as the Oresund Bridge that links Denmark to Sweden and the Chesapeake Bay Bridge-Tunnel in the eastern United States. Tunnels are dug in various types of materials, from soft clays to hard rocks, and the method of excavation heavily depends on the ground conditions. Cut-and-cover is a simple method of construction for shallow tunnels where a trench is excavated and roofed over. Strong supporting beams are necessary to avoid the danger of the tunnel collapsing. Shallow tunnels are often of the cut-and-cover type (if under water, of the immersed-tube type), while deep tunnels are excavated, often using a tunneling shield. For intermediate levels, both methods are possible. 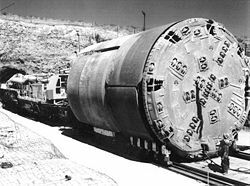 Tunnel-boring machines (TBMs) can be used to automate the entire tunneling process. There are a variety of TBMs that can operate in a variety of conditions. One type of TBM, called an earth-pressure balance machine, can be used deep below the water table. This pressurizes the cutter head with air or another fluid in order to balance the water pressure. As a result operators of the TBM must go through decompression chambers, much like divers. Until recently the biggest TBM built was used to bore the Green Heart Tunnel (Dutch: Tunnel Groene Hart) as part of the HSL-Zuid in the Netherlands. Its diameter is 14.87 meters. Currently there are four even larger machines: two for the M30 ringroad in Madrid, Spain; two for the Chong Ming tunnels in Shanghai, China. These machines are 15.2 meters and 15.4 meters in diameter, respectively. The New Austrian Tunneling Method (NATM) was developed in the 1960s. The main idea of this method is to use the geological stress of the surrounding rock mass to stabilize the tunnel itself. Based on geotechnical measurements, an optimal cross section is computed. The excavation is immediately protected by thin shotcrete, just behind the excavation. This creates a natural load-bearing ring, which minimizes the rock's deformation. By special monitoring the NATM method is very flexible, even at surprising changes of the geomechanical rock consistency during the tunneling work. 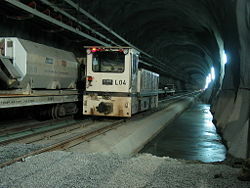 The measured rock properties lead to appropriate tools for tunnel strengthening. In the last decades also soft ground excavations up to 10 kilometers became more common. Pipe Jacking, also known as pipejacking or pipe-jacking, is a method of tunnel construction where hydraulic jacks are used to push specially made pipes through the ground behind a tunnel boring machine or shield. There are also several approaches to underwater tunnels, for instance an immersed tube, as in Sydney Harbor. The twenty-first century is likely to see the arrival of tunnels connecting continents: the Strait of Gibraltar tunnel connecting Western Europe and Africa and the Bering Strait tunnel connecting Asia and North America. Construction of the tunnels can bring a new focus to peace efforts as unprecedented levels of international cooperation will be required for the success of such ventures. The Bering Strait tunnel project especially will require breakthrough levels of peaceful cooperation between key countries in order to realize the huge potential economic benefits to be achieved by linking the two hemispheres heartland to heartland. Fulfilling the Bering Strait tunnel's purpose will require that it be connected by proper railways and roads to existing transportation infrastructure in Asia and North America. Planning for the Bering Strait project is underway by groups in Russia, the U.S. and Korea. Looking beyond railways, some planners are envisioning a set of tunnels serving as the transit locus for a multipurpose "peace" corridor conveying freight, information, power, passengers, and resources. The qanat or kareez of Persia is a water management system used to provide a reliable supply of water to human settlements or for irrigation in hot, arid and semi-arid climates. The oldest and largest known qanat is in the Iranian city of Gonabad, which after 2,700 years still provides drinking and agricultural water to nearly 40,000 people. Its main well depth is more than 360 meters and its length is 45 kilometers. The Eupalinian aqueduct on Samos Island (Ionia) was built around 520 B.C.E. by the Ionian engineer Eupalinos. Eupalinos organized the work so that the tunnel was begun from both sides of the hill and the two teams met in the middle. The estimates for the time required range from five to 15 years; the mountain is solid limestone and one has to suppose that many of the slaves doing the work died. The tunnel's existence was recorded by Herodotus (as was the mole and harbor, and the third wonder of the island, the great temple to Hera, thought by many to be the largest in the Greek world). The precise location of the tunnel was only re-established in the nineteenth century by German archaeologists. The tunnel proper is 1,030 meters (3,432 feet) long and visitors can still enter it. Sapperton Tunnel on the Thames & Severn Canal in England, dug through hills, which opened in 1789, was 3.5 kilometers long and allowed ship transport of coal. Above it runs the Sapperton Long Tunnel which carries the "Golden Valley" railway line between Swindon and Gloucester. The tunnel created for the first true steam locomotive, the Penydarren locomotive, was able to make his historic journey from Penydarren to Abercynon in 1804. Part of this tunnel can still be seen at Pentrebach, Merthyr Tydfil. This is arguably the oldest railway tunnel in the world, for self-propelled steam engines on rails. Box Tunnel in England, which opened in 1841, was the longest railway tunnel in the world at the time of construction. It was dug and has a length of 2.9 kilometers. 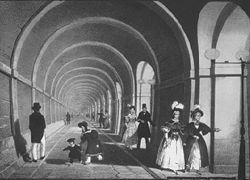 The Thames Tunnel, built by Marc Isambard Brunel and his son Isambard Kingdom Brunel, opened in 1843 and was the first underwater tunnel and the first to use a tunneling shield. Originally used as a foot-tunnel, it is now part of the East London Line of the London Underground. The Cobble Hill Tunnel and Murray Hill Tunnel in New York City are the world's oldest railway tunnels lying below streets, roofed over in 1850 and the 1850s, respectively. The oldest sections of the London Underground were built using the cut-and-cover method in the 1860s. The Metropolitan, Hammersmith, Circle and District lines were the first to prove the success of a metro or subway system. Col de Tende Road Tunnel, one of the first longer road tunnels under a pass. The Seikan Tunnel in Japan is the longest rail tunnel in the world at 53.9 kilometers (33.4 miles), of which 23.3 kilometers (14.5 miles) is under the sea. The Channel Tunnel between France and England under the English Channel is the second-longest, with a total length of 50 kilometers (31 miles), of which 39 kilometers (24 miles) is under the sea. The Lærdal Tunnel in Norway from Lærdal to Aurland is the world's longest road tunnel, intended for cars and similar vehicles, at 24.5 kilometers (15.2 miles). The St. Gotthard Tunnel from Göschenen to Airolo in Switzerland, opened on September 5, 1980, is the world's second longest highway tunnel at 16.32 kilometers (10.14 miles). The Ryfast road program in Stavanger, Norway includes the tunnel Solbakktunnelen, which is scheduled to be opened within 2015. This tunnel will be 14 kilometers long, making it both the world's longest underwater road tunnel and longest underwater highway tunnel. The tunnel will have four driving lanes in total, and a speed limit of 90 kilometers per hour. The Hsuehshan Tunnel in northern Taiwan opened on June 16, 2006, with a length of 12.955 kilometers (8.05 miles). This tunnel is the longest highway tunnel in Asia and the fourth in the world (as of 2006). The Rennsteig Tunnel in middle Germany runs under the Thuringian Forest over a length of 8.5 kilometers (5.2 miles) and is currently Germany's longest tunnel. The highway A71 connects Erfurt with Schweinfurt. The North Cape Tunnel in northern Norway, connecting the island of Magerøya with the mainland, was the world's longest undersea road tunnel when opened in 1999, at about 7 kilometers. It reaches a depth of 212 meters below sea level. Päijänne Water Tunnel is the world's longest complete tunnel that is bored into cliff. It is located in southern Finland and it is 120 kilometers long. Its purpose is to provide the greater Helsinki metropolitan area with fresh water. New York City Water Tunnel No. 3, started in 1970, has an expected completion date of 2020. The Chicago Deep Tunnel Project is a network of 109 miles (197 kilometers) of tunnels designed to reduce flooding in the Chicago area. Started in the mid-1970s, the project is due to be completed in 2019. The Fenghuoshan Tunnel on Qinghai-Tibet railway is the world's highest railway tunnel. The Houston Downtown Tunnel System is a system of tunnels about twenty feet below Houston, Texas's downtown street system. The system forms a network of subterranean, climate-controlled, pedestrian walkways that link 25 full city blocks. The Sydney Harbour Tunnel in Sydney, Australia was built in 1992 to augment the Sydney Harbour Bridge. ↑ The Groene Hart Tunnel, HSL-Zuid. Retrieved April 25, 2007. ↑ The two machines for Spain were built by Mitsubishi/Dura Fuelgo and Herrenknecht. The TBMs for China were built by Herrenknecht. ↑ Dan Hughes, The Tunnel of Eupalinos. Retrieved April 25, 2007. ↑ City Water Tunnel No. 3, New York City Department of Environmental Protection. Retrieved April 25, 2007. This page was last modified on 21 December 2015, at 20:04.